Oudenaarde (Belgium) (AFP) - Italian Alberto Bettiol won the gruelling Tour of Flanders on Sunday, riding home alone for a maiden career victory after breaking away with 18 kilometres to go. Dane Kasper Asgreen escaped the chasing group in the final straight to finish second with Norwegian Alexander Kristoff third. 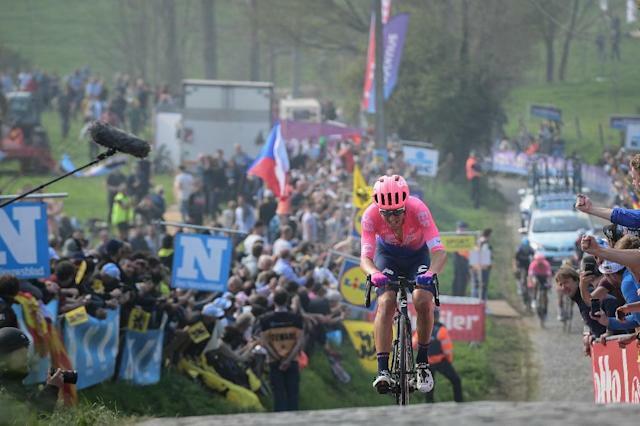 Bettiol, a 25-year-old who rides for American team EF First Education, attacked on the approach to the third and final ascent of the Oude Kwaremont. Belgian Olympic champion Greg Van Avermaet tried to give chase but could not keep pace as Bettiol shot up the two-kilometre-long cobbled climb. "I don't believe it," the Tuscan rider told Eurosport, saying he had followed instructions from Andreas Klier, the sporting director in the team car. "I was feeling really good, Andreas Klier told me: 'if you can go, go'," said Bettiol. "I closed my eyes and I just went." Klier, he said, told him: "Keep on pushing! Keep on pushing!" The chasing group contained many of the race favourites but none were prepared to lead the chase. Instead, Bettiol's team-mates Sebastian Langeveld and Sep Vanmarcke were able stay close to the front and slow the pursuit. "The last 14 kilometres were the longest of my life," said Bettiol. "I knew Sebastian was there protecting me," he added. Bettiol is the first Italian to win the of the 266-kilometre slog from Antwerp to Oudenarde, one of the five one-day monuments, since Alessandro Ballan in 2007. Mathieu van der Poel finished fourth despite a nasty slow-motion crash with a little more than 60 kilometres to go. The Dutch rider punctured and, as he braked and wrestled his bike to the side of the road, his front wheel locked and he flew over the handlebars. Despite a nasty bang to his left arm, he caught the leaders after a furious 15-kilometre pursuit. Defending champion Niki Terpstra was less fortunate. Dutchman Terpstra hit the tarmac with several other riders 160km from the finish and was knocked unconscious. Terpstra stayed down for several minutes. His Direct Energie team said he had been taken to hospital and that, because he had been unconscious for more than two minutes, doctors ruled him out of the next cycling monument, Paris-Roubaix in seven days' time.